Worked well on Sunday 6th April for the DDS's AGM. The exhaust was a bit on the smoky, more than usual. Friday 12th April saw a day of shunting along with a trip to Staverton to berth a coach and pick up the DMU. By the end of April the loco had had a good going over with a grease gun. The low vacuum reading on the loco has now been put right. The afternoon of 1st May had both 20s run up to test the vacuum. With the exhauster on 110 working hard to make the 20" only and when piped up to 118 only getting 18". With some adjustment to the relief valve on the system and the strainer cleaned a small improvement was made. This was still not acceptable so with 110 shutdown and 118 running a look around was made and a small hiss was heard under No.2 bogie. This was coming from a 2" pipe with loose nuts, which after tightening allowed the loco to make between 21" and 22"
It ran the two days (Sunday & Monday) over the Thomas weekend without trouble. Again on the diesel day (May 19th) the loco worked all ok, but the only thing was a traction motor cover decided to fall off one of the motors along the line. This was found by the next train, and was taken to the work shop to be straightened out at a later date. A replacement cover was refitted to the loco. 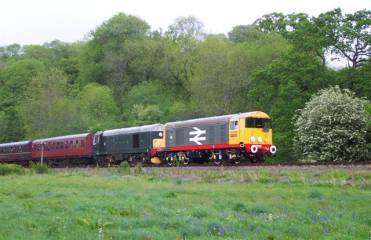 A day of shunts and a trip to Totnes to get things ready for the Jubilee weekend was done on Thursday 30th May. The loco had a morning of coach shunting on Sunday 2nd June, the 1950's Jubilee Gala weekend (1962!). 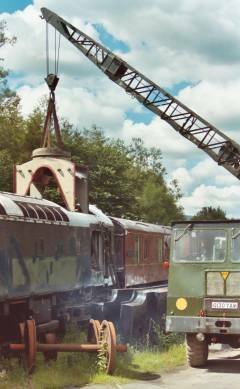 A full afternoon of shunting was carried out on Sunday 9th June. To get ready for a boiler lift on a sick steam loco. 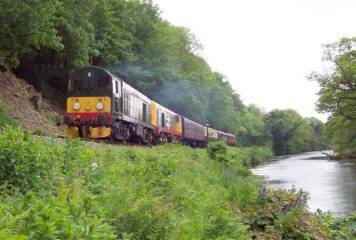 Loco worked well over the 6th April, and was put in multiple with D8110 at Totnes for the D.D.S's AGM. Only two small faults showed up, first was that the multiple working jumper cable at the nose end is not passing power and second, a valve/relays in the control cubicle has started to stick which stops you from restarting the loco. You have to wait for the air pressure to drop before it will start. This is the same fault as D8110 had last year. Mid April and the valves/relays had been serviced along with a good going around with the grease gun doing the brake rigging and the electrical machines. The vacuum system was making 23", this is now in par with 110 (21"- 22"). The strainer also had a clean out. The strainer is in the vacuum system to acted like a filter. 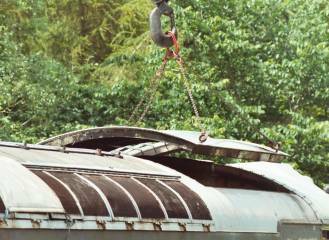 It is placed next to the exhauster to pick up any bits that come through the pipes of the wagons or coaches, so the air going through the exhauster is clean. The loco worked the Saturday of the Thomas weekend without any trouble. Only some small oil leaks around the power unit. Painting continues in and around the engine compartment, with the pipe work now getting colour coded. Loco worked well over the diesel day (May 19th). At the start of June the hand pump was fitted in the nose end compartment. This pump is used to top up the coolant water header tank. By the end of June, most of the pipes in the engine compartment were painted. Just leaving some touching up to do. The loco has now been covered over to help keep the sun off (when it comes out!) to help stop the paint from fading. Not a lot happening to the loco in April and May. But on Sunday 9th June the last bolts that held the roof panel down were freed and a set of lifting eyes made up and welded together by Mike Shaw. Mike is from the Sunday gang in the workshop, who was also finishing off the new exhaust for the loco. Later in the day the loco was shunted out from under cover of the stock shed to the North end crossing in readiness for the cooler group lift. This was carried out on the afternoon of Sunday 23rd, in four stages. First the roof, then the fan section , then the radiators and finally the tanks were lifted from each side. This left the loco some 5/6 inches higher at that end. A hole (large) was found in one tank and both have thin metal. A hole was cut into the leaking tank, only to find a large build up of sediment. The loco's roof around the section that is off has been cleaned up and primed, along with the header tank. By Sunday 30th a coat of undercoat was on, as rain was forecast for the following week. Much cleaning and scrapping was also done to the floor, later next month this will be steam cleaned. The under side of the roof section that is off was also steam cleaned (steam cleaner will not reach the loco, so a small one is to be hired) and what was black is now a creamy colour. A second roof panel over the engine was also taken off for cleaning. Sunday 21st April the loco was started up, but had to have an hour or so on the charger first. Loco now needs a drop of fuel, as the header tank only has 10 gallon left in it. This will be the first time the 09 has had fuel since arriving on the railway. 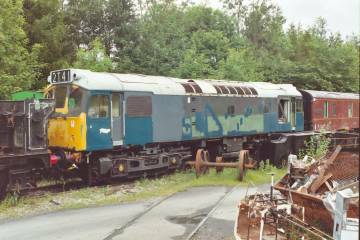 Been stored at Staverton for a week or two to make space at Buckfastleigh. Worked it's first train for the year on Thursday 9th May, doing four round trips for the owning group's spring visit. Most of the cab (brake van end) panelling is now back in place. In service. But restricted to station work only, due to reports of earth fault relay tripping. By the start of June the loco was stopped and not to be used. 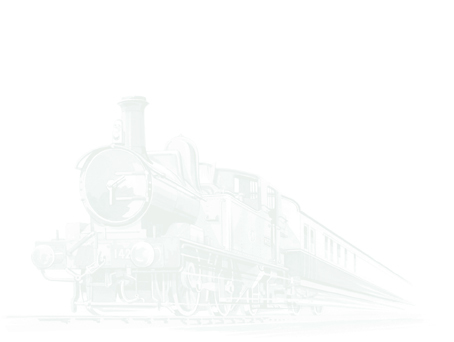 It is thought that the traction motor has flashed over. Worked over the groups AGM and again on the Sunday 7th April giving members driving experience, but later on in the afternoon the loco became sluggish. Later found that the fuel filter had got a bit clogged up. On the following weekend the injectors were removed for overhaul. 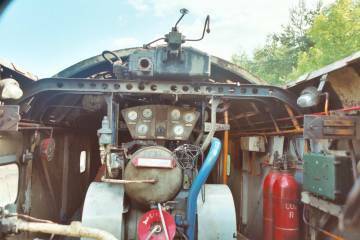 By the start of May the injectors had been returned and fitted to the loco on Sunday 12th, but for some reason the engine did not start. An electrical fault between the start button and the starting motor was thought to be the problem. The engine did start, by holding a relay in on the starting motor. Later in that week a wire was found to have come away from a connecting clip. Loco worked three days over the 1950's weekend, shunting and a trip freight. The axle boxes are to be checked over as water has got into one or two. An oil change for these is expected. MINK - W 104700 - new roof cover has arrived and over the coming month will be fitted onto the wagon. This will be a all day job. MINK `B' W125814 - With the better weather here! One plywood panel has had to be replaced as the outer layer had started to buckle and come away from the rest of the ply. By mid April it was fully repainted, but this panel carries the XP & wheelbase along with a small black panel for servicing data. This has now been redone, which just leaves the last bits of wood over the doors to fit along with the locking bars on the doors. It is hoped to have the van finished and all locked up by the winter (or when the colder rain comes!). The battery charger appears to work all ok. It was plugged into 20118 without anything going bang and charged at 20 amps for a time although the batteries were already well up. It has had a coat of paint on the inside and now waits for the outside to be done. Two new covers have arrived for the two new spare power units and will be in place on them by the winter. The first Sunday of the Month is to be a full working day, plus someone will be around on other Sundays. 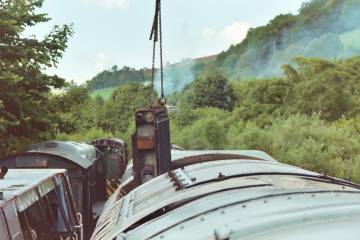 If you turn up between 09.00 & 09.30 at Buckfastleigh. All help is most welcome. Work is varied. At the moment a lot of cleaning is required and later on, painting. Following this some wagon/van repairs are to be done. Sunday dates are as follows:- 4th August, 1st September, 6th October. It has been agreed to hold a working day on the first Sunday of each month on a regular basis. This is to allow members/shareholders who live some distance away from the railway to make arrangements to attend. Also those who are nearer will know when to come along.